Peel and cut potatoes into ½-¾ inch pieces. 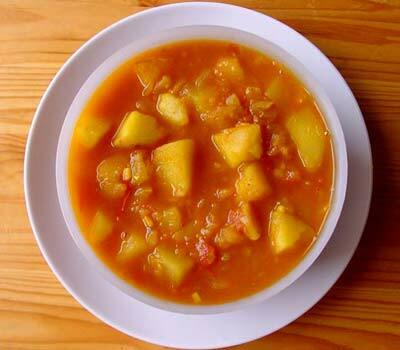 Mix Potatoes, sauce and one jar (15 oz) of water in a cooking pot. Cook for 10-15 minutes, (until boils) over medium high heat, with occasional stirring. Add salt and more water if needed. The product should have thick uniform gravy with large chunks of potatoes. Transfer to a serving dish. Garnish with cilantro and serve warm with Naan or Basmati Rice. Rice - Basmati rice is the more authentic but any rice will work fine. Bombay Potatoes: Add half a jar water instead of one full jar and cook over medium heat uncovered for 8-10 minutes (or till the liquid is almost dried up) carefully lifting and turning potatoes with a wide spatula so as not to break them. Makes for a great side dish.